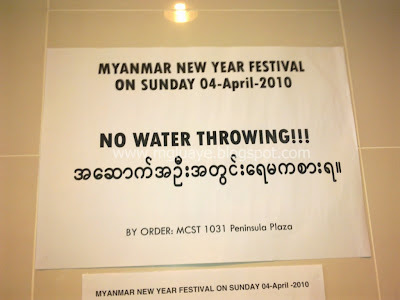 It is regretted to inform you all that Peninsula Plaza of Singapore will restrict throwing (splashing) of water inside its premise in Myanmar New Year time (4th April 2010). I saw these two sheets of A4 sized paper ads on several locations in Peninsula Plaza this morning. But don’t worry. There will have festive ground in Padang in front of City Hall, will be entertainment stage with famous singers from Myanmar and there will have one more water festival in Bukit Batok organized by Bukit Batok GRC. Peninsular Plaza MC should have allowed this since they are survived by Myanmar shops and of course Myanmar shops cannot be exist without Myanmar citizen customer. I rate it B- grading to those who got idea to stick it. who must have assistance with this one situation. Hi my friend! I want to say that this article is awesome, nice written and come with approximately all significant infos.